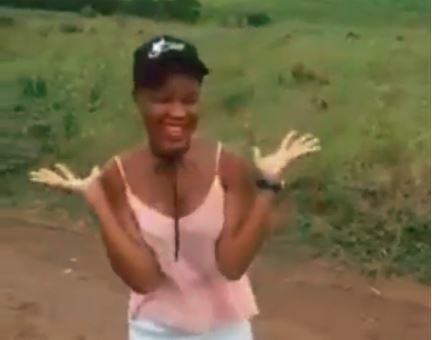 Home / BREAKING NEWS / #UnDVDyelani manje young lady is now a viral video star. #UnDVDyelani manje young lady is now a viral video star. One of the most amazing things about being a South African is that despite having eleven official languages (and many unofficial ones), we always find a way to add more words to our vocabulary, and the latest word UnDVDyelani is all the proof you need. The word has been doing the rounds on social media after a video of an unknown woman being recorded without her knowledge went viral. In the video the woman who was caught off-guard and wanted to find out why she was being recorded blurted out, "Undvdyelani manje?" (why are you filming me). However, the direct translation of the word means, "why are you DVD'ing me?". In case you haven't caught on to it yet, here's a little 411 for when you do! UnDVDyelani manje: a newly famous phrase meaning why are you taking a video of me (without my consent). From an unidentified viral star. Why is it almost as cool as "where are the pots"? Where and when can you use it? When: Anytime, you are caught off-guard and its on camera. The zero chill in Mzansi resulted in a challenge and some of your favourite celebs also went for it. What would a trend be without a song? In SA? Nothing fam!